ZURICH (AP) — Sepp Blatter was re-elected as FIFA president for a fifth term on Friday, chosen to lead world soccer despite separate U.S. and Swiss criminal investigations into corruption. The 209 FIFA member federations gave the 79-year-old Blatter another four-year term after Prince Ali bin al-Hussein of Jordan conceded defeat after losing 133-73 in the first round. Prince Ali’s promise of a clean break from FIFA’s tarnished recent history was rejected despite the worst scandal in the organization’s 111-year history. The election went ahead Friday after U.S. and Swiss federal investigations struck at the heart of Blatter’s “football family” this week. Two FIFA vice presidents and a recently elected FIFA executive committee member were still in custody Friday as the votes were counted. Still, soccer leaders worldwide stayed loyal to their embattled president of 17 years, even though Prince Ali pushed the election to a second round by getting a surprising 73 votes. Before the second round started, Prince Ali stood before the congress and conceded. Blatter has blamed others for bringing shame and humiliation on the sport. In a pre-election address to voters on Friday, Blatter said it was “impossible” for him and FIFA to “keep an eye” on everyone and be responsible for everything that happened in world soccer. 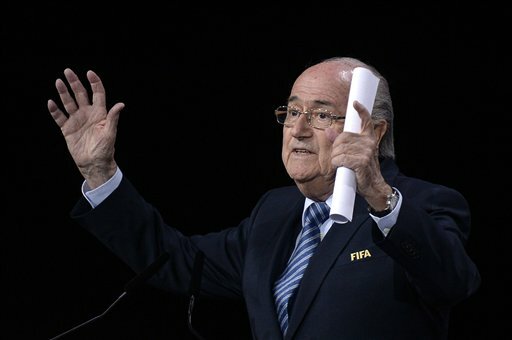 Blatter won despite calls for his resignation from UEFA president Michel Platini and others. Platini said Thursday that UEFA could pull out of FIFA and withdraw from the World Cup if Blatter was re-elected. FIFA’s big-money sponsors have also called for change within FIFA. Visa warned Thursday that it could pull out of its contract, which is worth at least $25 million a year through 2022. In what appeared to be warning to UEFA, Blatter pledged to change the representation of his influential executive committee, where Europe currently has eight of 25 voting members. Platini sat still and did not clap during Blatter’s post-victory speech. Blatter also said he would retain a 32-team World Cup and resist expanding what is FIFA’s cash cow. The defeated 39-year-old prince was a FIFA vice president for the past four years with a close-up view of Blatter’s previous scandal-hit mandate. Blatter was re-elected unopposed in 2011 after promising to fight corruption and support key investigations of the 2018 and 2022 World Cup bidding contests and a bribery scandal which removed his Qatari opponent from the presidential ballot. Those probes were conducted in-house by FIFA’s own judicial bodies. The latest investigations promise deeper trouble for FIFA with federal law enforcement agencies delving into soccer’s affairs. Raids on FIFA’s favorite luxury downtown Zurich hotel and its own headquarters were launched early Wednesday by Swiss police. Senior FIFA officials were among seven men arrested at the request of American federal prosecutors investigating bribery, money-laundering and wire fraud. The 2018 and 2022 World Cups — awarded to Russia and Qatar, respectively — are the focus of a separate Swiss federal probe of suspected financial wrongdoing. Last November, Blatter and FIFA filed a criminal complaint with the Swiss attorney general’s office against non-Swiss nationals.